Ray Dalio, Gründer des weltgrößten Hedgefonds und mehrfacher Milliardär findet zu Recht mit seinen Aussagen weltweite Aufmerksamkeit. Erst vor zwei Wochen habe ich seine Gedanken zu den Märkten ausführlich besprochen. „Ray Dalio (…) made the speaking round at Davos, and revealed the answer that all investors ask themselves every now and then: ‚what scares most the billionaire founder of the world’s biggest hedge fund?‘ The answer: the next downturn in global growth, which will hit both markets and the economy, when central banks will have virtually no ammo to spark another rebound. 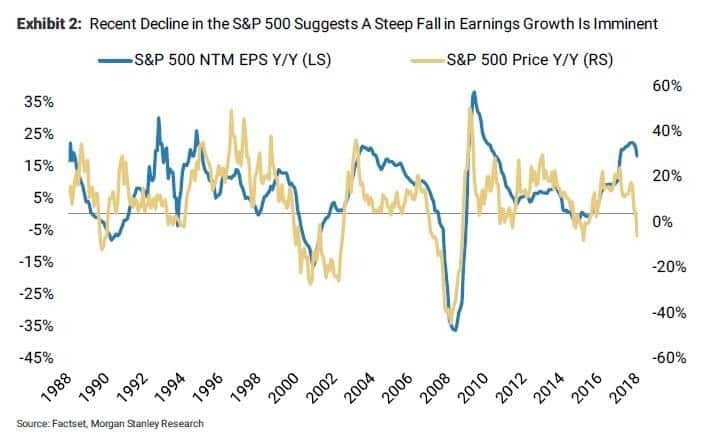 Dalio’s comments come at a time when investors are increasingly concerned about a serious global economic slowdown, which shadow consensus has pegged for early 2020.“ – bto: Da kann man nur sagen: zu Recht. Allerdings glaube ich, dass wir sehr wohl noch große Potenziale haben. Die Helikopter werden schon intellektuell vorbereitet. „Speaking at a panel discussion on the first day of the World Economic Forum, Dalio said: ‚The US, Europe, China – all of those will experience a greater level of slowing, probably a greater level of disappointment. I think there’s a reasonable chance that by end of that, monetary policy and fiscal policy will have to become easier relative to what is now discounted in the markets.‘“ – bto: Das werden sie wohl werden. Und zwar deutlich. Die Frage ist allerdings, wird die EZB darauf genauso reagieren (können) wie die anderen Notenbanken? Wenn nicht, droht hier erhebliches Ungemach. „‚What scares me the most longer term is that we have limitations to monetary policy, which is our most valuable tool, at the same as we have greater political and social antagonism,‘ Dalio said during a panel discussion at the World Economic Forum (WEF) in Davos on Tuesday. ‚So, the next downturn in the economy worries me the most, (…) There are a lot of parallels with the late 1930s. In 1929-1932 we had a debt crisis, and interest rates hit zero. Then there was a lot of printing of money and purchases of financial assets which drives financial assets higher.‘“ – bto: was zunächst natürlich schön ist, allerdings bekanntlich die Ungleichheit steigert. Was auch Dalio anspricht: „It creates also a polarity, a populism and an antagonism. We also had at that time the phenomenon of a rising power, like China, dealing with conflict with an existing power. These types of political issues are now very connected to economic issues in policy.“ – bto: Das Problem China – USA habe ich auch schon ausführlich besprochen. In der Tat eine gefährliche Situation, was auch erklärt, weshalb die US-Regierung jetzt versucht, den Aufstieg Chinas, wenn nicht zu stoppen, so doch zu verlangsamen. „Echoing a point he has made repeatedly over the past two years, Dalio said these types of political issues – together with growing protectionism – bear a striking resemblance to market conditions during the final years of the Great Depression in the late 1930s. ‚These types of political issues are now very connected to economic issues. So I think that’s the character of the environment that we are in,‘ Dalio said.“ – bto: Und wir werden gerade in Deutschland sehen, wie die sozialen Konflikte förmlich explodieren, wenn wir aus unserem Märchen aufwachen. „As a result of what may soon be an earnings recession, Jensen said that he expects to see lower interests rates, particularly on the short-end of the Treasury curve, or in other words, he expects the Fed to make monetary easing great again; he also warned that regions that have priced in high growth expectations will be hurt the most, and no region has priced in more ‘growth’ than the US, with the decoupling between US stocks and the rest of the world now absolutely historic.“ – bto: womit auch klar ist, dass die US-Börse besonders gefährdet ist. „Jensen does not believe the next market swoon will emerge from the US; instead he said ‚European markets will be the first test‘ as the region is ‚starting from a worse level in terms of the economy, lower inflation – close to deflation in many places – and already have negative interest rates‘ adding that ‚their movement will be kind of a leading indicator because they’re going to struggle more with easing‘ than the U.S. or China, which have ‚more tools available to them.‘“ – bto: weshalb man auch wissen muss, dass gerade die Anfälligkeit der Eurozone für einen Schock so gefährlich ist. Deshalb ist das Brexit-Theater so gefährlich. 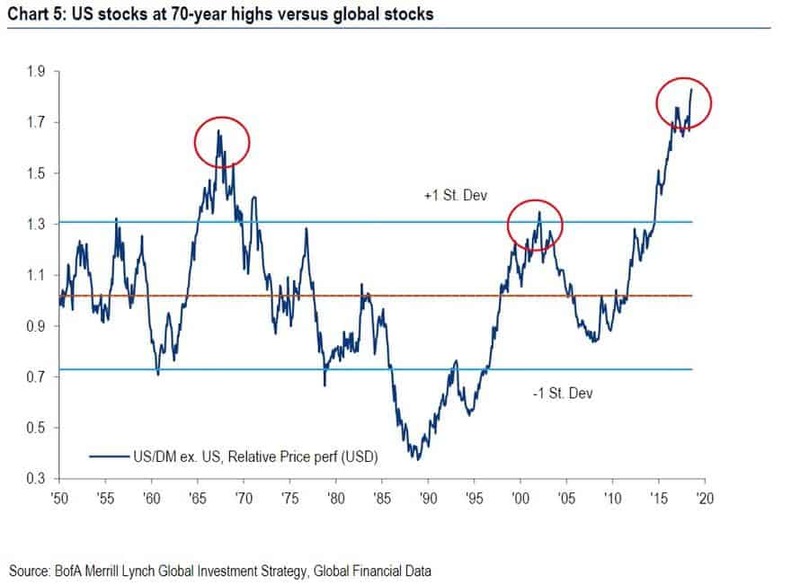 „(…) Jensen said growth in 2019 would be near recession levels at about 1 percent in the U.S., and slightly lower for the rest of the developed world; (…) ‚cash continues as a viable alternative to U.S. stocks and bonds.‘ – bto: womit alles gesagt ist. Auch Bridgewater weiß, wenn ein Markt einfach zu teuer ist. Warum das Futur „werden… sehen“? Hat das Aufwachen nicht schon längst begonnen? Sei es bei politischen Wahlen, bei Bürgerinitiativen oder medial in den sozialen Netzwerken und Blogs? Die AFD ist nicht aus dem Stand zur größten Oppositionspartei im Bundestag gewählt worden, weil bisher noch keine sozialen Konflikte im Lande waren. Und auch dieser Wirtschafts-Blog (wenn technisch schon realisierbar) wäre bei einer aktuellen wirtschaftlichen Entwicklung wie z.B. in den 1950er-Jahren eher nicht nötig. Ich sehe den Beginn des Aufwachens mit den staatlichen bzw. geldpolitischen Reaktionen auf die Weltschuldenkrise nach Lehmann verortet. Das Hauptproblem mit zu hohen Zinsen am ZLB hat die EZB. Die US Zinsen werden steigen trotz unbegrenzter Munition seitens des FED Systems. Zusätzlich wird Fluchtgeld seinen Weg nach den USA antreten… weg von der EU, GB, China, Japan….und nur ein Teil Anlage in Russland finden. –> Nicht abwerfen wollen, weil der Neid noch größer ist als die Dummheit soviel Geld zu drucken! #Glaubenssatz: Deflation tötet überschuldete Zombies genauso wie Inflation. Das beherrschbare Maß geht in volatilen Märkten verloren. Jajaja. Zentralbanken können auch nie „pleite“ gehen. Schon klar. Aber was interessiert mich, wie viel „Munition“ die Zentralbank von zum Beispiel Zimbabwe noch hat, wenn ich mich grundsätzlich weigere, deren Stücke wertloses, bedrucktes Papier anzunehmen?